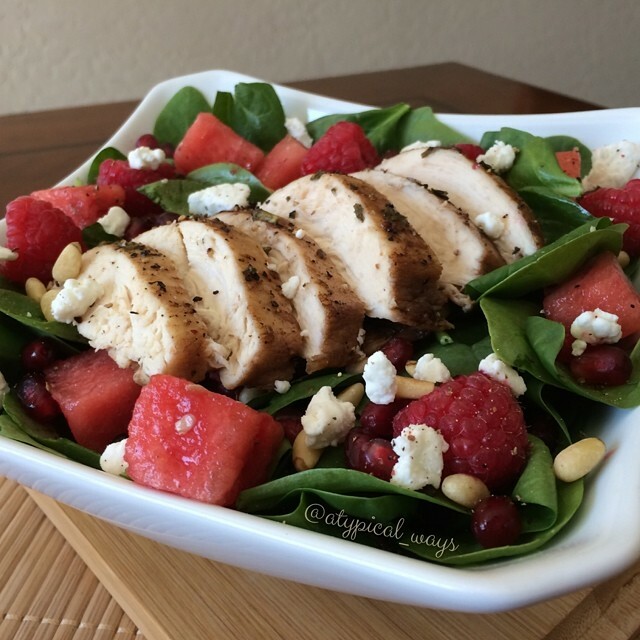 Watermelon, Pomegranate & Raspberry Spinach Salad with a Balsamic & Mint glazed Chicken breast topped with toasted Pine Nuts & crumbled Feta cheese 330cal/23carb/7fat/36pro. Preheat oven to 400 degrees. In a small bowl mix the balsamic, stevia, mint and the add raw chicken that has been seasoned with fresh ground pepper. Allow raw chicken to marinate 5-10 minutes while the oven is preheating. Cook on a foil lined baking sheet for 20 minutes. While chicken is cooking cut up the watermelon and toast the pine nuts over medium-high heat. Once chicken is done cooking, allow to rest for 5 minutes. Layer spinach, watermelon, raspberries, pomegranate seeds. Slice the chicken breast and place on salad. Top with pine nuts & feta cheese.